My name is Shane, and as the Our World Underwater Scholarship Society Dr. Lee H. Somers American Academy of Underwater Sciences 2018 intern, I have two primary goals for this summer – complete the AAUS scientific diving class, while simultaneously getting hands-on field research at Bigelow Laboratory for Ocean Sciences. My first full week in Maine has been getting settled in and getting into a rhythm. Maine is a lot like home — Minnesota — and so the transition of settling in has been an easy one. What we do not have in Minnesota is a front row seat to the amazing and powerful Atlantic Ocean or the focus of my research: kelp! At Bigelow, I am being mentored by Dr. Doug Rasher, a senior scientist working on collecting kelp growth data on the coast of Maine. Along with Dr. Rasher, I will be working closely with his post-doc, Thew Suskiewicz. 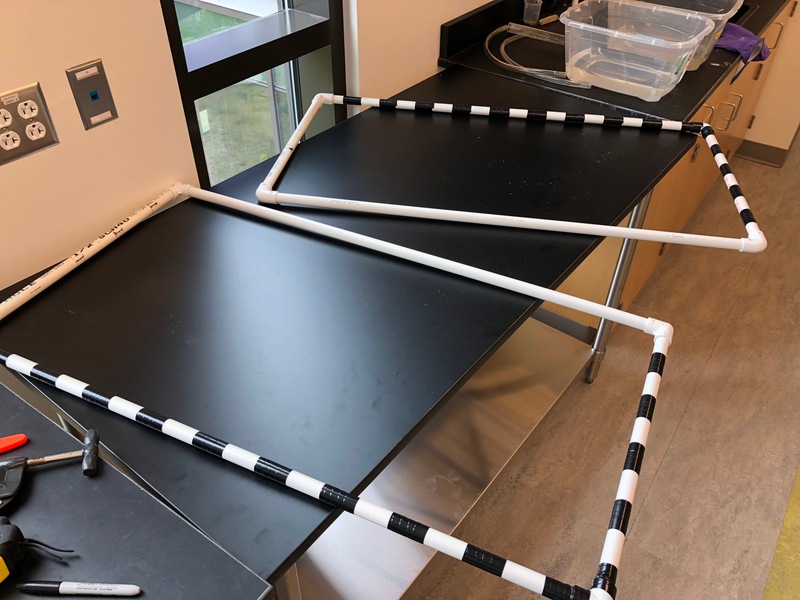 During my first few days, Doug and Thew put me on the task of making rectangle half-meter quadrats out of PVC. This seemingly small task was nothing of the sort, as they entrusted me to accurately and thoroughly prepare five quadrats to perfect specifications. If built too large or small even by an inch, could skew the valuable data we will be collecting. An example of the five half-meter quadrats made from PVC. Black tape lines two sides every 5cm for video analysis. After completing the quadrats and acquiring the appropriate materials, Thew and I were simulating my job during a dive. For these first dives, I will be cutting and collecting kelp and other seaweed for biomass samples back on the surface at the lab. After gear organization and checks, sampling material and methods completed, my last task during my first week at Bigelow, was digitizing kelp cover data from the 1990s. In Excel, I would copy the site location, depth, date, and percent cover of kelp from paper records. It’s the less glamorous side to science and scientific research but will be helpful and necessary later in the process. 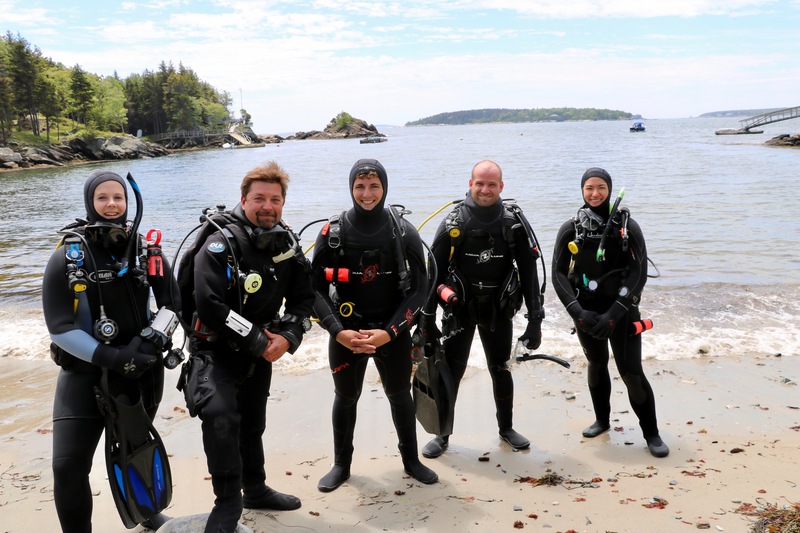 Not only am I working at Bigelow, but on Wednesdays, I head up to the Darling Marine Center part of the University of Maine to take my AAUS class with Chris Rigaud, a world-class diver, and instructor. The first AAUS class was mainly orientation and fitness testing such as the 400 and 800 yard swims. We briefly entered into the surprisingly warm (55oF) salty water of the Damariscotta River. In this brief “check-out” dive we reviewed skills such as cramp removal, taking off and putting on our BCD’s, and inflating our emergency signaling devices. These seemingly simple tasks even for a relatively novice diver are important. Chris said this about the exercise, “What separates professionals (scientific divers) from others, is they practice the small things, they practice all the little details too. That way if the time comes when they need to use that skill, they’ve done it.” He went on to say, “I’ve been lost in the ocean and it isn’t fun” in reference to when he asked us to inflate our signaling devices. Suited up for the first dive practicing key skills like buoyancy and navigation. From left to right: Colby (assistant instructor), Chris (instructor), Shane (me), Nick (student), and Rachel (student). This really stuck with me, and I’ve been thinking about it ever since. That was great advice especially at the beginning of the summer. It is the small things that can make the difference between completing an experiment correctly or having a successful safe dive. The small things can help you in a dive emergency if it arose. Attention to detail now can pay dividends later. I don’t just want to go through the motions this summer. I want to learn as much as possible and apply everything I can, even the small seemingly insignificant details. Any skill, even if I’ve learned it before, I can still get something new from the experience. This summer I am looking forward to having a lot of “firsts” but also expanding on what I already know. Next week is diving and lots of it! Thank you to Our World Underwater Scholarship Society, American Academy of Underwater Sciences, and Bigelow Laboratory for Ocean Sciences for giving me this great opportunity. This entry was posted in 2018 Somers AAUS, OWUSS on June 15, 2018 by Shane Farrell.